Dearfoams Slippers. Slip your feet in these pretty slippers. Microfiber Velour/Embroidery Thread. Soft rubber sole for indoor/outdoor. I will make things right. If there is any issue with your item. Style: Slipper Shoes. Dress & Formal. Fashion Sneakers. Toe Style: Closed Toe. Save up to 90% on the. Strap Type: None. Closure Type: Slip On. These shoes typically show a little more wear in their soles and may have blemishes such as scuffs and/ or wrinkles. Dear foamsslipper flip flap pink gray. Develop a nice cozy friendship with the acrylic Pile platform slipper from Dearfoams. This snuggly slipper has a soft and luxurious upper, lining, and sole, wide roomy toe, cushioned platform, and an indoor/outdoor textured outsole. The Pile not only warms your sole, it will warm your heart. Gentle machine wash cold. No bleach. Size 7-8 Warm and Cozy Slippers - For both indoor and outdoor use - Blue on the Upper with Faux Fur Lining and Rubber Sole. Functional elastic gore for custom fit. multi-density cushioned insole. proven sidestitch indoor/outdoor outsole with dearfoams logo. Slide into softness and feel top-to-bottom comfort in these lightweight spandex slippers. XL (11-12). Indoor Outdoor sole. Machine washable. & Sleep Mask Set. The sleep mask has the word. The words "But First, Coffee" are. embroidered on one shoe, and a coffee. has soft pink satin lining inside. Style Number: DFCOM 30572. "Roasted" sewn on the front, and. These pretty sleet (gray) slip on slippers feature: round toe; comfortable covered cushioned footbed; comfort soles for safety; machine washable. These will be oh soooo comfy! They are considered indoor/outdoor footwear. Cancellations can not be processed. Very Pretty Royal Purple With a Paisley High / Low Design. Clog style, knit dye. New in box. Size Small 5-6. Indoor or outdoor use. Machine washable, dry flat. Treat yourself or a loved one to these plush knitted slippers. Our cozy fleece lining and faux fur cuff are the perfect combination for comfort. TB 3/29/19 A2142 OOS They are preowned in great condition. Soles show faint wear. Insoles show faint wear. Shoes have minor creases. Soft plush polyester.Sure-grip soles. Machine Wash. No blemishes.Clean.No Odors. Bought wrong size. Padded insole and soft plush top material. STILL ON BOARD THAT HANGS FROM RODS. Dearfoams Soft Supple Terry Cloth Slippers. Uppers: Synthetic Terrycloth fabric. Color: Gray. There is very light wear on the uppers with no visible scuffs. Linings & Insoles: There is very light wear on the inners. MAKES A GREAT GIFT OR TREAT YOURSELF. 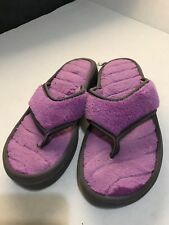 Dearfoams Memory Foam Womens Indoor/Outdoor Slippers - Womens Size M 7-8. The listing says with box, but they never came with a box. They were bought in store, hanging up. All tags are attached. Brand new. Machine washable. Super cushioning. I do not offer returns, so please ask any questions before purchase. Thank you.